This was the question that I posed to my friends and family as soon as I got my ice cream maker. I figured if I'm going to be making ice cream, I might as well find out what everyone's favorites are, right? Right. Well, I have to say I was a little surprised at some of the answers. First of all, most people gave me BRANDS of ice cream, rather than FLAVORS of ice cream. They'd say "Breyer's" or "Ben and Jerry's." I had to go back and say, "No, I mean I want to know what FLAVOR of ice cream is your favorite." And even then, they'd say a brand name plus the flavor, like "Häagen-Dazs Dulce de Leche", or "Ben and Jerry's Coffee Coffee Buzz Buzz Buzz". "Ok, lets try this again, just tell me what FLAVOR you like!" Whew! I didn't think I was asking such a complicated question!!!! It wasn't until I finally just decided to Google it that I found out that Vanilla and Chocolate are first and second (respectively) in the favorite flavor department, and Butter Pecan comes in a very honorable third. 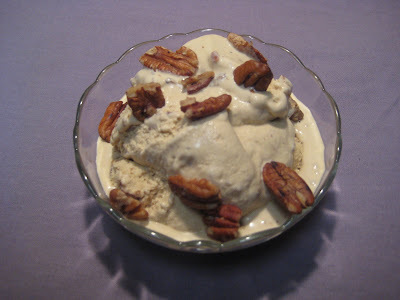 So, clearly, Butter Pecan needed to be included in my birthday week of ice cream making. Well, not only that, but also it was one of my Mom's favorites, and it's also my BFF Paul's favorite too. Even if pecans are not your thing, I think you should try this recipe. Just leave the pecans out! Yes, it's true that they add a yummy toasty flavor to the ice cream, but the browned butter brown sugar ice cream is so yummy, you won't even miss 'em! In a medium thick-bottomed saucepan on medium heat, melt the butter stirring constantly, until it just begins to brown. Add the brown sugar and salt. Stir until the sugar melts. Be careful not to burn! Slowly add the milk, stirring to incorporate. It will foam up initially, so make sure you are using a pan with high enough sides. Heat until all of the sugar is completely dissolved. Do not let it boil or the mixture may curdle. Whisk the egg yolks until they lighten in color. Slowly pour half of the milk/sugar mixture into the eggs, whisking constantly to incorporate. Then add the warmed egg mixture back into the saucepan with the remaining milk/sugar mixture. Stir constantly over medium heat, scraping the bottom as you stir, until the mixture thickens and coats the back of a spoon, about 5-7 minutes. Pour the custard through the sieve and stir it into the cream. Add vanilla. Chill mixture thoroughly in the refrigerator. While the mixture is chilling, place pecans in a dry skillet over medium heat and toast them for a minute or two, just until they become aromatic. Be careful not to burn them! Add a tablespoon of butter and a pinch or two of salt. Give them another toss and then place them on a tray to cool. Once cooled, give them a rough chop. Fold in the chopped pecans. Scoop the soft ice cream into an airtight container and place in the freezer for at least an hour, preferably several hours. If it has been frozen for more than a day, you may need to let it sit at room temperature for a few minutes to soften it before serving. To speed up the cooling process, place your cooked custard base in a bowl, then place the bowl in a larger bowl full of water and ice. Be careful not to get any of the water in the custard! The ice water bath will chill the base for you in no time!